Buy a wine cellar from someone who is wine savvy! Our mission is to provide full service expertise to clients who are designing, building and installing a wine cellar. Unlike other wine cellar companies, Compleat Wine Cellars demystifies the wine cellar construction process, with a no-nonsense approach. We advise you on selecting and employing the proper short, medium and long-term storage of wine. 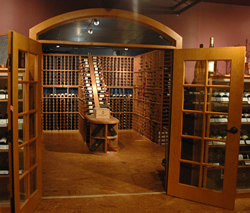 Your wine cellar requirements are unique, so we evaluate your needs and desires on a case-by-case basis. Our attention to detail means we can recommend a "turn-key” wine cellar built to suit your budget – whether it’s a custom design to complement the home’s decor - or an efficient and affordable customized kit racking solution. Our on-site showroom gives you the opportunity to see a working custom wine cellar. Please contact us to schedule an appointment.